Feb. 18, 1860 There is a small & untitled Winslow Homer print on the ftpg., plus another: 'Allow Me to Examine the Young Lady' and yet a 3rd Homer:'Hon. J.M. Curry of Ala.'. Very nice dblpgctrfld: 'View of Broadway, Opposite Fulton St., N.Y.' at winter time. 'Pope Pius the 9th'. 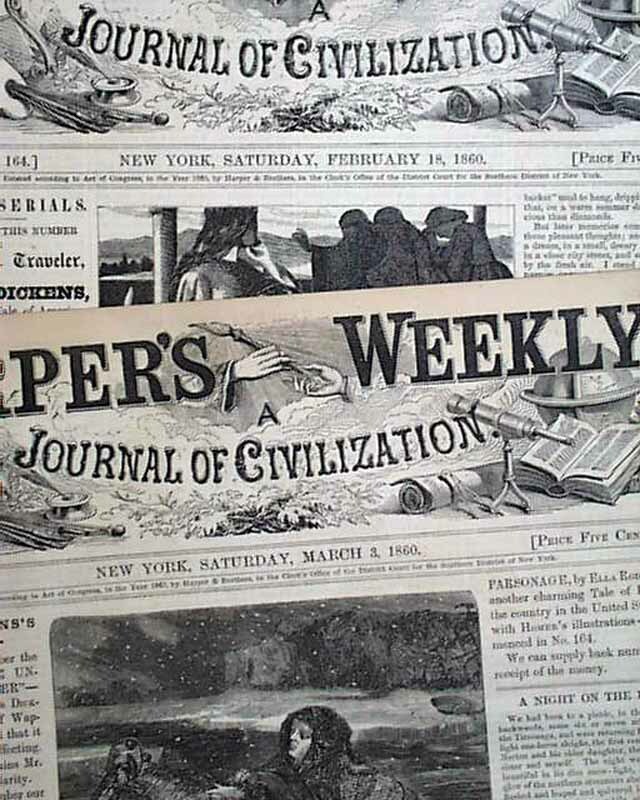 This issue also contains the 1st installment of "The Uncommercial Traveler", by Charles Dickens. Feb. 25, 1860 Full ftpg. illus: 'Clark Mills' Statue of Washington'. Halfpg: 'Bridge over Green River on the Louisville & Nashville Railroad'. Halfpg: 'Hon. Clement C. Clay of Alabama'. Small Winslow Homer print: 'The Meeting After the Marriage'. 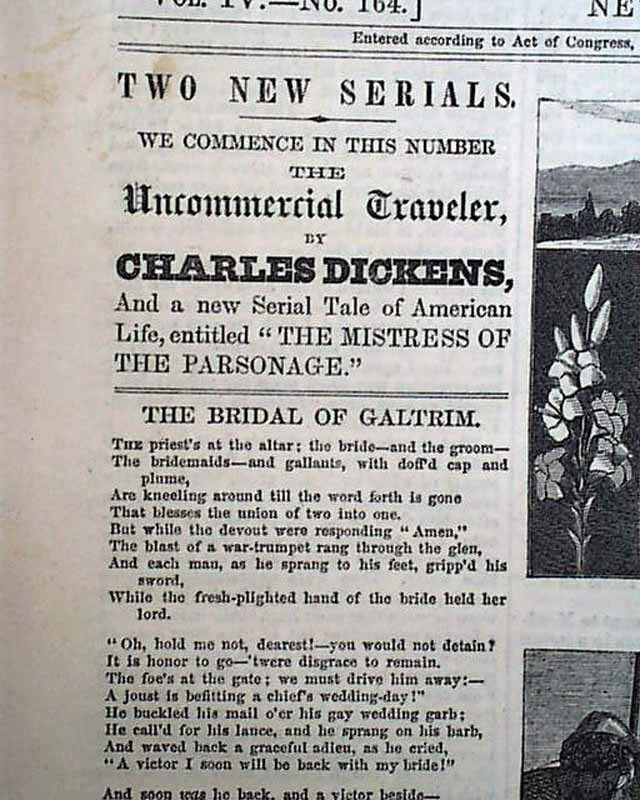 This issue also contains the 2nd installment of "The Uncommercial Traveler", by Charles Dickens. Mar. 3, 1860 Ftpg. shows the wreck of the 'Hungarian' off Sable Is., Nova Scotia. Fascinating print: 'Great Sea-Serpent Found in Hungary Bay, Bermuda'. Halfpg: '7th Reg. Marching up Penna. Ave., Washington City'. Two small Homer prints: 'The Buds' and 'Mrs. Otcheson at the Piano'. 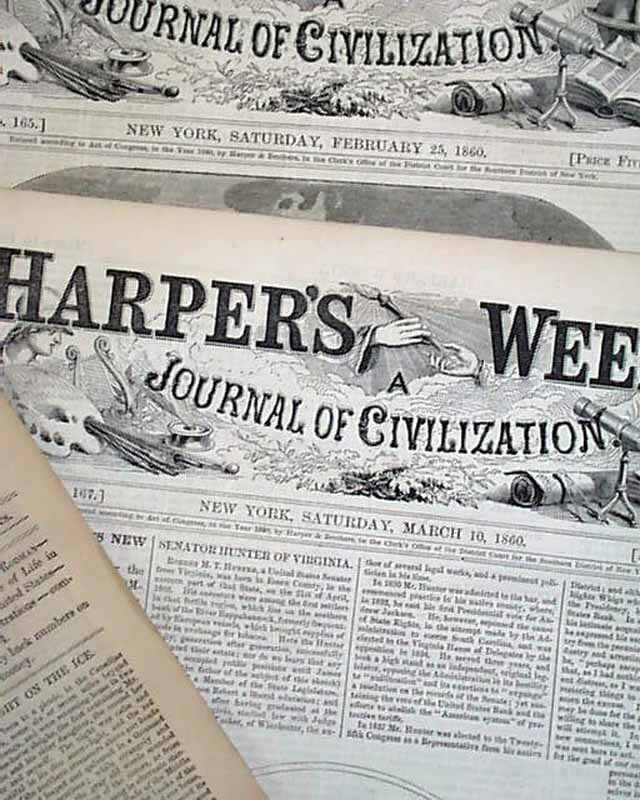 This issue also contains the 3rd installment of "The Uncommercial Traveler", by Charles Dickens. Mar. 10, 1860 Ftpg: "Hon. Robert M.T. Hunter, U.S. Senator from Virginia". "Gen. Amos Pillsbury, Chief of the N.Y. Metropolitan Police". Rather small W. Homer print: "On The Beach". Fullpg: "The Gale of Feb. 10th in New York Bay". "The Steamer 'Peytona' ". 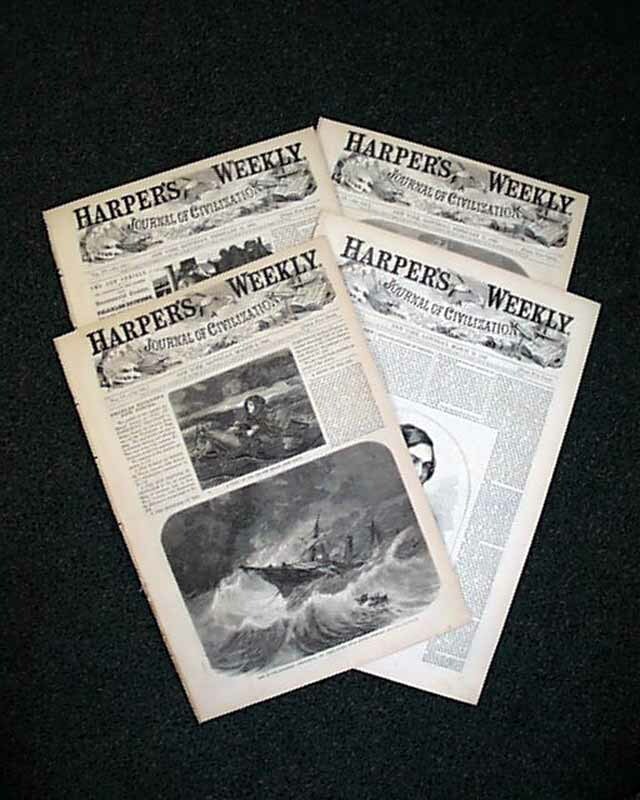 This issue also contains the 4th and final installment of "The Uncommercial Traveler", by Charles Dickens.